Six Tactical offers a variety of tactical weapons course training for firearm operators of all levels of experience. 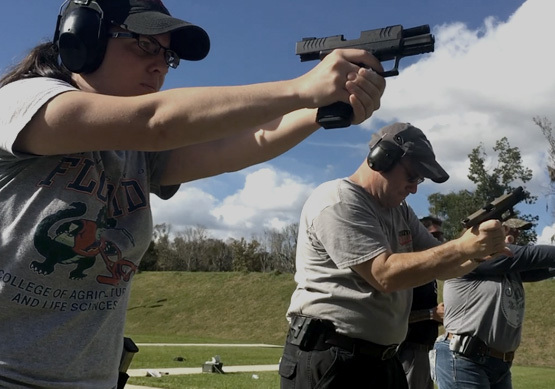 With Tactical Pistol, gun owners and those with a concealed carry permit can continue their gun education beyond the NRA Basic Pistol Course. Six Tactical's pistol training course in Florida provides a tactical advantage in real-world situations. Tactical Carbine courses provide semi-automatic rifle users the skills required to become an exceptional shooter. And for those shooters who want to train at the highest standards, Six Tactical offers a Long Range Precision Fire course designed and instructed by former U.S. Marine Corps Scout Snipers and Special Operations personnel. Six Tactical doesn't just provide weapons training. We know that true threat mitigation and confrontation avoidance comes from human behavior pattern recognition, knowing how to defend oneself unarmed, situational awareness, and decision making under pressure. Six Vigilence teaches individuals the tools necessary to manipulate an environment based on a "human terrain" that is observable when you know what to look for. This course is ideal for anyone traveling to a high-risk area, law enforcement officials, first responders and even managers. To take what you learn in Six Vigilence one step further, Six Tactical offers an Active Shooter Mitigation course which relies on teaching the value of situational awareness and adequate preparation. But being aware and prepared does not always mitigate a threat. Our Unarmed Defense course prepares those who may not always have a weapon to defend themselves in hand-to-hand and hand-against-weapon combat. Underneath all of this training and knowledge should be a solid foundation on which your team can stand firm. Six Tactical's Special Operations Leadership & Team Building Lab helps all types of teams — sports teams, student groups, corporate staffs, etc. — work together with effective communication, leadership and decision-making under pressure.